Numerous electrical problems may be discovered in attics. 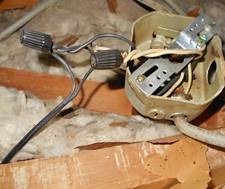 This photo shows, among other things, how a lamp cord was inappropriately used to feed components in living spaces below the attic. As the lamp cord ages it will present a fire hazard to the home.